After having a meltdown at CVS over buying (or not buying) gift cards for my sister's birthday, Mom and I decided to de-stress by retreating to Bourne for some seafood. 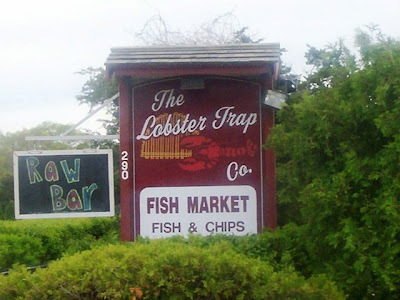 That's one of the plus sides to living in Southeastern Massachusetts - you're never too far from having dinner on the Cape. Since we've been on a Cape Cod kick these days, Mom decided to look up popular seafood joints in the area that we haven't yet visited. 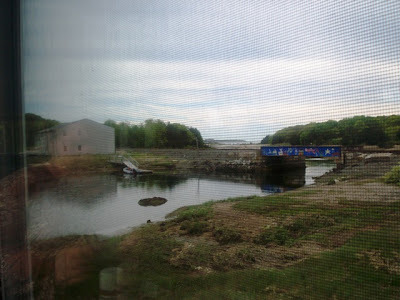 She came across Lobster Trap, located a few minutes off of that horrible rotary on the other side of the Bourne Bridge. Going out to dinner always cures any kind of misery, so we were more than happy when we finally pulled into the parking lot at 4 p.m.
At first I thought the waitress said $20.30, which would have been fine, but when I realized what the price actually was, I was a little surprised. It just seemed a bit much for two dinners and a couple of sodas. However, this was Cape Cod. Everything is priced a little higher than it is back home. The waitress, who may or may not be named Jackie (according to the receipt), told us that she would bring our meals out to the dining area. I noticed that the receipt had an order number printed at the bottom, and I got the impression that on busy days, they call out your number and you pick up your food at the pickup window. The dining room is huge and has a great sea-theme, from the thick wooden columns to the large ship's wheel at the center of the room. Green plastic table and chair sets are scattered throughout the dining area, while colorful buoys hang in the rafters. Beautiful windows that overlook Buzzards Bay surround the room (which actually extends out into the water), and there was a small bar located off to the side that had plenty of liquor to go around. Although it was quite fun, Mom and I were wondering where the advertised outdoor dining was. Perhaps they remove the large windows as I've seen some restaurants do, giving the appearance that the customers are dining "outside" on a deck. In all fairness, we did not go behind the restaurant to see if there was any seating available in the back. 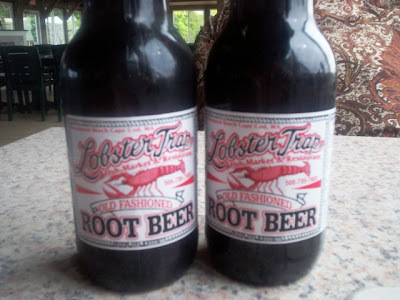 As we waited for our food, which didn't take long to arrive, Mom and I sipped our root beer. I don't know if it was the added sugar (since we're so used to diet soda), but it was delicious. Once our food was brought over in small red baskets, we were glad to see that both plates were served piping hot and with a side of tarter sauce and cole slaw (both sets came to me). Mom's piece of fish was quite large and sitting atop a mound of crispy, dry fries. The fish itself had a light crust and the inside was beautiful, flaky, and white. It was perfectly done and tasted absolutely delicious. 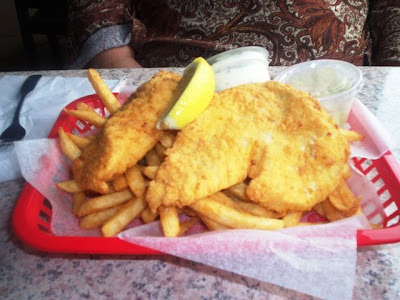 Mom said that it joins the ranks of her best fish and chips dishes. My clam strips were also excellent. The batter was nice and dry, and the strips inside were tasty and sweet. The fries were also very flavorful, and the cole slaw was cool and refreshing. These clams strips are some of the best that I've had, and the portion was just perfect. 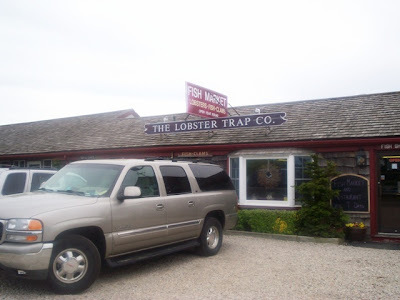 Mom and I really enjoyed eating at Lobster Trap, but we have to be honest. We feel that the restaurant is a bit overpriced - even for the Cape. 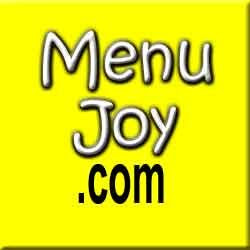 For example, they serve a jumbo lump crab cake for $8.99, and that's just ONE. For $8.99 at most places, you get two or three crab cakes. Also, you're going to pay $5.99 for a stuffed quahog at Lobster Trap when you can get them down here for as low as $2.25 (and that's with linguica). As you can see, the prices are quite different than what we're used to. Although the food is very good, you may want to bring a little extra money if you plan on eating here. Even Mom's fish and chip plate was about $3-4 dollars more than it would have been elsewhere. Oh, and get this! If you bring your kids, you're going to pay $5 for a hot dog and $5 for a grilled cheese sandwich. Ouch! And if you want dessert, plan on paying $4.59 for a milkshake. I'm sure it's good, but it's definitely on the expensive side. Before the long ride home, we visited the restroom which was very clean and organized. As we left Lobster Trap, we joked about how much better we felt than we did when we first set out for Bourne. Maybe seafood really does make you feel better! 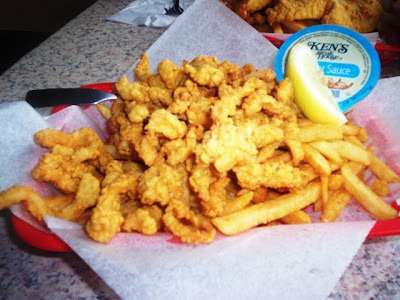 People should stop taking antidepressants and instead, go to Lobster Trap for some fish and clam strips. I'm telling you - it works miracles! 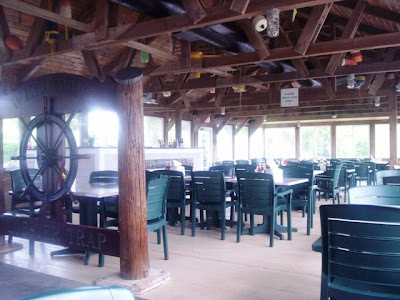 Lobster Trap's summer hours are from 11 a.m. to 8:30 p.m. daily.